Day 1 attracted a field of 157 entries and Shaun Deeb led the field into Day 2, where nine more players jumped into the action to create a field of 166 entries and a prize pool of $1,560,400. Only the top 25 spots were paid and Mike Gorodinsky was the sole late entrant to make a profit after finishing in 19th place for $15,229. Among the big names to fall before the money bubble on Day 2 were Daniel Negreanu, David "ODB" Baker, Jeff Lisandro, Chris Ferguson, start-of-day chip leader Shaun Deeb, Benny Glaser, John Monnette, and 2016 champion Jason Mercier. Scott Cole ended up as the bubble boy after calling all in on sixth in Razz only to find himself drawing dead. Before bagging and tagging, notables such as Jean-Robert Bellande (26th - $15,229), Andrew Barber (25th - $15,229), Stuart Rutter (21st - $15,229) and Joey Couden (18th - $15,229) departed to see just 16 players in contention for Day 3. The last scheduled day of the event began with a bang over on the feature table as Katherine Fleck was the first to depart and the next four players to bust all ran out of chips on the PokerGO live stream table. This included Jean Gaspard (15th - $17,677), Illya Trincher (14th - $20,993), Anthony Zinno (13th - $20,993), and Robert Mizrachi (12th - $24,498). Carol Fuchs ended up in 11th place and the field was reduced to the official final table after Jake Schwartz (10th - $25,498) and Robert Campbell (9th - $31,656) departed. Iraj Parvizi was the chip leader heading into the final eight while Michael Noori had fewer than one big bet left. Noori chopped to chip up and busted shortly after in a battle of the blinds with Daniel Zack despite flopping top pair, as Zack got there with a runner-runner wheel in Omaha Hi-Lo. Almost five hours later, it was Zack that bowed out next and Albert Daher ran out of chips soon after. 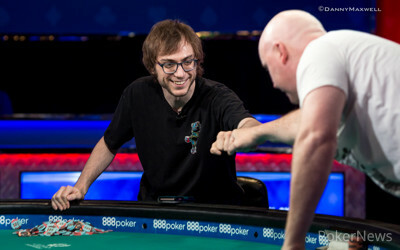 Parvizi was all smiles at the final table and pointed out several times that he was an amateur facing the top pros. The Brit shifted gears with an all-out attack style, even playing several hands in the dark, and that changed the stack sizes of all remaining finalists drastically. Randy Ohel was left short after being scooped by Parvizi and his low draw in Seven Card Stud Hi-Lo bricked off, while Hennigan made a straight and a low to end Ohel's run in fifth place. The roller coaster ride of Parvizi came to an end after another two and a half hours of frantic action in fourth place and 1998 WSOP Main Event fifth-place finisher Lee Salem went from chip leader to out in third place in the penultimate level of the night. 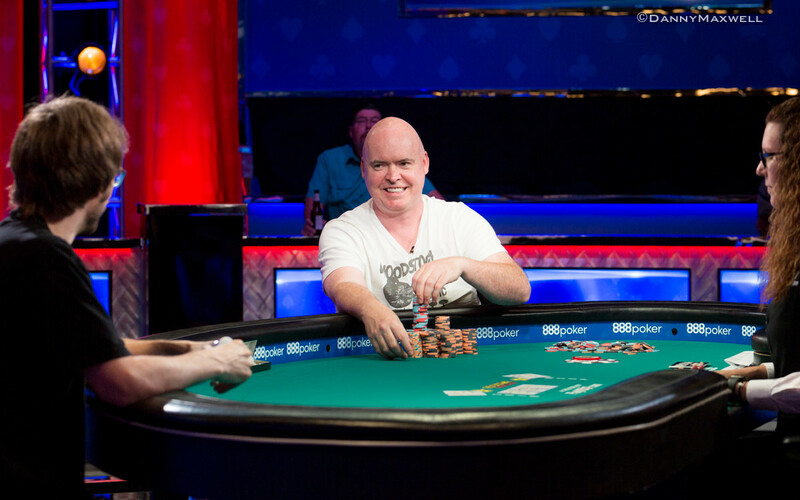 Hennigan and Baker went back and forth in the final level of the night without being able to wrap it up, opting to return fresh the next day in order to determine a champion. 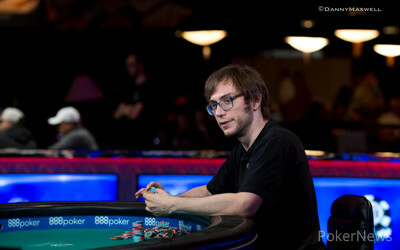 It took another full level of play, one where Baker doubled up several times to keep his shorter stack afloat. In the end, however, Hennigan took it down. His path to victory was tumultuous, though, and he continued to praise Baker for how he handled Parvizi's tilting play. "He (Parvizi) is getting in these big pots with not very good hands, and we're all trying to play tight and last, and now he's busting people out or killing their stack with kind of unorthodox, to say the least, plays. The tilt was born there and I was not immune to it. I can't say enough about how well David Baker held up under that. He really played Iraj well and the rest of us didn't." With seven players left, Hennigan was the short stack with just 3% of the chips in play. However, a crucial pot where he essentially doubled up was the turning point. "The key moment in the day (yesterday)...I think I had the king-queen of hearts. I was very short on chips and it was raised and reraised. I just decided that this was a good chance to gamble and win a nice pot to put me back in the tournament. Flop nothing, and it came heart heart and it really put me back in the game. I never really got in bad shape after that." Hennigan was appreciative of capturing bracelet number five, but won't let it get to his head too much. "We'll see what happens. I'm not too preoccupied with it, but five does feel better than four." David "Bakes" Baker was all in already from the big blind for 65,000 and John Hennigan called the extra 5,000 to complete his small blind. Baker showed , leading Hennigans' . The board came down , giving Hennigan queens and treys to eliminate Baker in second place. 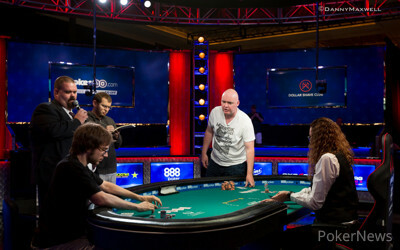 David "Bakes" Baker raised from the button and John Hennigan called from the big blind. The flop came down and Hennigan checked to Baker who continued. Hennigan check-raised, Baker called and the turn fell. Hennigan checked, Baker bet, Hennigan check-raised again and Baker called (leaving just 65,000) behind. The river was the , Hennigan bet and Baker folded. John Hennigan completed with the five and David "Bakes" Baker raised, Hennigan called. Baker checked his king on fourth and called a bet before doing so again on fifth and sixth. Both players checked seventh and Hennigan rolled over the first, Baker flashed and Hennigan also revealed his other two cards. He had the for a pair and scooped the pot. Hennigan completed with the six and Baker raised, Hennigan called. Baker paired his four and bet, a quick fold followed. David "Bakes" Baker completed, John Hennigan raised his bring-in and Baker called. Baker check-called bets from Hennigan from fourth street all the way through seventh street where both opted to check. Baker tabled for a pair of sixes, Hennigan mucked and Baker won the pot. John Hennigan had the bring in with a trey and David "Bakes" Baker completed, Hennigan called. Hennigan bet fourth to sixth and picked up two calls before Baker's paired queens ended up in a fold on sixth. Baker picked up one small pot after and the game type changed. Hennigan had two pair, kings and fives, while Baker had to hope for running straight cards or diamonds. Hennigan received the on sixth and Baker indeed picked up the diamond draw with the . Hennigan's last card was the and Baker squeezed over the for a runner-runner flush. "Wow, you really got there?" a stunned Hennigan asked and paid off the double up. John Hennigan raised from the button, David "Bakes" Baker three-bet from the big blind, Hennigan four-bet and Baker called all in for 500,000. Hennigan tabled , while Baker showed . The flop came down giving both players a set, although Hennigan had the better one with a set of queens. Baker, though, also had a flush draw and got there when the turn fell. The river was the giving both a full house, but Baker had the better one with aces full of eights to double through Hennigan again. David "Bakes" Baker raised and John Hennigan called to see a flop of . Hennigan checked and subsequently raised, which Baker called. Hennigan bet the turn and Baker called before the river paired the board. Hennigan bet, Baker raised and Hennigan called. 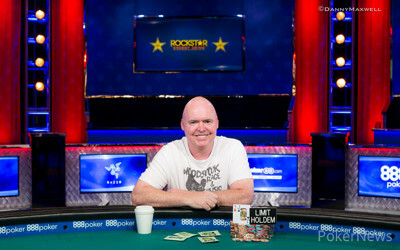 Baker showed the for a full house, Hennigan tabled for a flopped straight and a low to miss out on the scoop. Two walks followed before the next pot emerged. Baker raised and Hennigan called. The flop came and Hennigan check-called a bet before doing so again on the turn. On the river, Hennigan bet and Baker called. Hennigan showed the for a set of queens and Baker mucked .